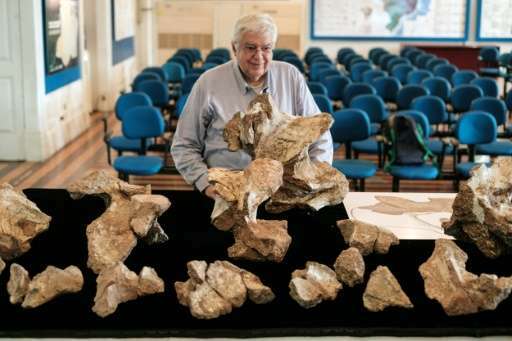 Brazil just found its biggest ever dinosaur—in a storage cupboard. In its prime, more than 66 million years ago, this long necked herbivore was 25 meters (82 feet) long—longer than an articulated bus—and could chomp through trees at a terrifying rate. By the time the creature was found by renowned Brazilian paleontologist Llewellyn Ivor Price in 1953, only a few hefty, fossilized bits of the spine remained. Researchers knew immediately they'd stumbled on something big. They didn't have the staff or resources to figure out how big, however, so the dinosaur pieces languished the next six decades in storage at Rio's ornate Museum of Earth Sciences. The remains of what has been named "Austroposeidon magnificus", and pronounced Brazil's biggest dinosaur, went on general public view for the first time Thursday. A nearly complete spinal vertebra—about the size of a microwave oven and entirely petrified—and numerous fragments of other vertebrae lie on a black cloth in an upper room of the museum. Nearby hangs an enormous artist's rendition, done to scale, of what "Austroposeidon magnificus" might have looked like: a small head, long neck, enormous body and long tail. A patch of the reptile's skin is shown pulled back to reveal where the prize vertebra would have slotted in. Museum director Diogenes de Almeida Campos said six decades does sound on the slow side for studying such a big find. "A friend said to me just yesterday, 'Diogones, what, it took you 60 years? '," he recalled with a wry smile. "It sounds a bit ridiculous to say this." 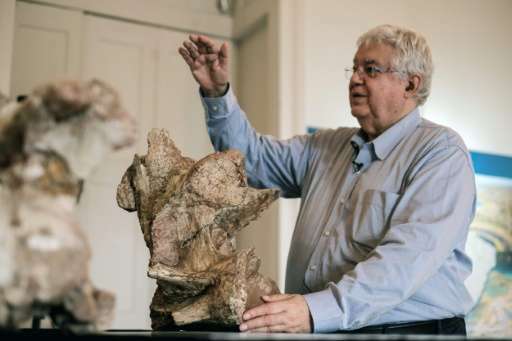 But he explained that in the 1950s Price and his assistants were pioneers in the field for Brazil, and while "it was certain that vertebrae of this size came from a gigantic animal, it needed to be studied." Campos said money was an issue holding back research, as well as a lack of people up to the task. Even today there are only 10 serious dinosaur experts in the country, he said. "We were waiting for the staff..., for a laboratory that started from nothing to mature," he said. "We made a first effort with students about eight years ago and it didn't succeed." Finally, Campos' student Kamila Bandeira made the mysterious monster the subject of her doctoral thesis and over the last four years put the pieces of the puzzle together. The most spectacular dinosaur discoveries come in desert or largely bare areas, such as the US southwest, the south of Argentina or Mongolia, where they are easier to find. The fossilized bones of the biggest dinosaur known to date—an estimated 40 meters (130 feet) long—were unearthed in Argentina in 2014. 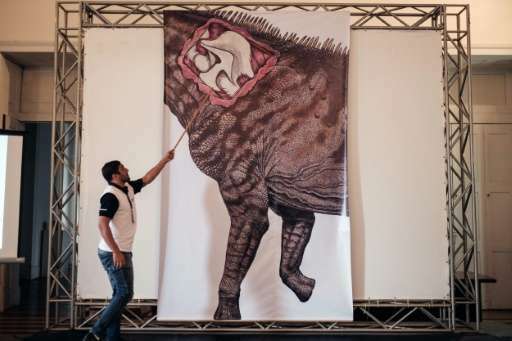 "Austroposeidon magnificus" was found, like many other dinosaur remains, by chance during road building near Sao Paulo. The reason only a few fossilized bones were found—and not the whole skeleton—points to the creature's unceremonious end, Campos says. "When these animals die, it's... a huge new source of meat. So all the hunters, the carnivores ate this creature. The first thing they ate is the head, because the brain must be tasty," said Campos. "They also broke the long bones to get at the marrow... After, came smaller animals and nothing was left over. Anything that did remain the beetles and the spiders and the ants finished, and when there was just bones, the bacteria came. Finally the remains sank into the lagoon." There may be many such discoveries waiting to be made in Brazil's thick flora. "Pay attention when roads are built, when wells are dug," Campos advised. "You could have a dinosaur in your backyard and not realize!" A lifetime hanging around fossils of extinct giants has given Campos, 73, unique perspective on creation and destruction. But today's world, where human activity dominates for the first time, disturbs him. "Extinction is as normal a thing for paleontologists, as is the appearance of a new species," he said. "But in comparison with what's happening today—the disappearance of tigers or whales—this is not caused by nature." 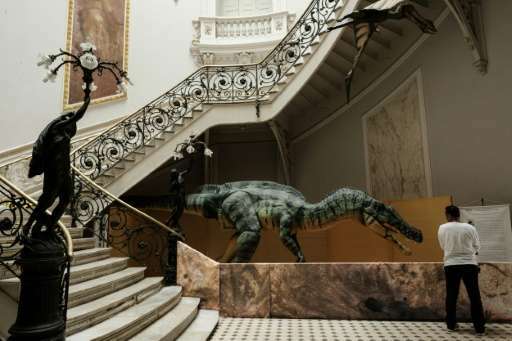 In the palatial but at times shockingly decrepit Rio museum—a victim, like many other Brazilian public institutions, of underfunding—Campos said his job was a great passion. He recalled studying under the great Price and "traveling with him over almost all of Brazil, collecting materials." Tears sprang to his eyes as he pointed out that he, Price and Bandiera were all now linked in a kind of paleontologists' family tree. Dinosaur hunting, he said, his voice brimming with emotion, "is an activity you can compare to art." Why should it be worrying? After all, isn't this how evolution is supposed to work? Those that cannot handle the heat in the kitchen get burned. Those that can supposedly survive. So the evolutionist should actually be rejoicing that they are witnessing some of the biggest and swiftest evolutionary changes right in front of them with their very own eyes. If on the other hand you believe in the God of Abraham, Isaac and Jacob, then you'd be concerned that you are failing in your responsibility as the keeper of the planet.